Abdooumtes10 000 years ago, wheat was domesticated in the Levant Region. It is believed that from that region, 3,000 years ago, wheat was introduced into Oman. Since then, it has been cultivated in various oases of the country resulting in large genetic diversity adapted to the marginal conditions and high temperatures of Oman. It is believed that preserving this genetic diversity directly benefits farmers growing wheat on these marginal lands. 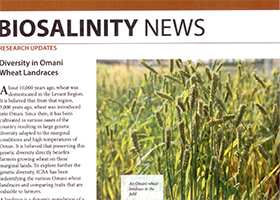 To explore further the genetic diversity, lCBA has been indentifying the various Omani wheat landraces and comparing traits that are valuable to farmers. Shahid, M., Jaradat, A. A., Rao, N.K.